Nowhere is this more true than your customer relationships. 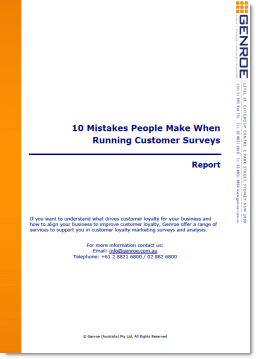 It is at the heart of Net Promoter Score … or any customer feedback program for that matter. However, the more I spoke to people and the more I learnt what was possible, the more I realised my optimal performing NPS program “just ain’t so”. So I set out to understand in detail just exactly what went into a high performing Net Promoter program. In my analysis I identified 121 separate, but important, attributes of a high performing NPS program. At first it seemed too many to be realistic but whenever I tried to remove one I found I just couldn’t – each was important in it’s own right. What we do know “for sure” is that there are certain key areas that need to be considered and actioned effectively to have a high performing program. In this post I’m not going to go through all of them but I am going to highlight 25 that are particularly critical. Internal communication: do all staff really understand the what, why and how of NPS? Reward & Recognition: Integrating Net Promoter into your R&R planning to ensure long term success. How effectively do you collect data: Is your data collection comprehensive, reliable and robust. Staff need to believe the data to take it seriously. Good governance: sounds boring but governance is critical to NPS success. Average case response and close times: closing the small loop quickly and effectively. Documentation standards: nobody wants documentation for documentation sake but you need solid documentation to support the system. Data segmentation: being able to report on the right data segments underpins continuous improvement. Data analysis process and frequency: there is a rhythm to effective data analysis, getting that right is critical. Project shortlisting process and frequency: identifying and shortlisting the highest value projects. Project prioritisation process and frequency: having a process to identify the right project to do now. Quality of customer feedback: distinguishing high quality feedback from low quality feedback, and acting only on high quality. Business cases: ensuring projects are approved comes down to a solid business case. Customer churn reporting: small changes in customer retention have big impacts on business value – you need to track churn. “At Risk” customer value: knowing this will help you to know how much to invest in customer retention. Process for managing “At Risk” customers: exactly what do you do when you identify an at risk customer? Customer communication: how, what and when do you communicate with customers for maximum impact. Up-Sell capability: sell them more of what they have already purchased. Cross-Sell capability: sell them new and different products. Research shows a very high take up of new products by promoters. Online review generation: positive reviews drives sales, it’s as simple as that! Loyalty Programs: providing the right added value for customers drives long term loyalty. Referral Programs: you already know your most loyal customers, let them help you market your business. Hmmm… I think we would score fairly low on the health check… lots of work to be done on our journey to take over the Australian woolpress market. Helen, everyone is on a journey with respect to customer loyalty. You may not be as far behind as you think. Good luck.